Everyone knows that eating fish has a lot of benefits for humans. From its lean, healthy protein to its omega-3 fatty acids, fish is a healthy, delicious alternative to other protein sources. Unlike beef, pork, and chicken, fish is also more environmentally friendly, contains less fat, and is loaded with nutrients! Given all of these benefits, it makes sense to consider whether or not fish might also be a healthy source of food for your dog. Is fish healthy for dogs? Can fish be eaten raw? What kinds of fish are best? What pet foods include fish as a main ingredient? While most dog foods privilege other sources of protein, fish can have important health benefits for your dog. Dog food with fish oil are good for your dog’s overall health and growth. Although some myths persists that fish is bad for dogs, and while fish has not historically been a major part of a canine diet, it can be a healthy alternative for some pets! Can Dogs Eat Fish? Is Fish Good for Dogs? Eating fish helps your pet lose weight. Fish is a healthier alternative to other protein sources and can help your pet from packing on the pounds. Since protein is an important part of a dog’s diet, feeding them fish can be a better way to make sure they get the nutrients they need without gaining any excess weight! Fish is an excellent source of protein. All dogs require protein in order to maintain their health, strength and vitality. Fish can provide a great alternative source of protein instead of chicken, beef, or pork! 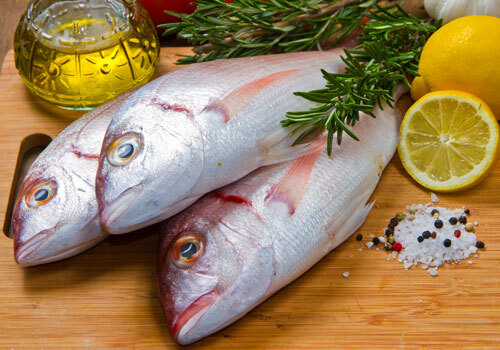 Fish provides important nutrients such as omega-3 and fatty acids. Many people take fish oil supplements for these same benefits, and they can improve your pet’s health as well! Omega-3 and fatty acids are a healthy, safe source of cholesterol and fat without any of the negative aspects of bad cholesterol and fat from red meat. Just like for humans, omega-3 acids don’t occur naturally in dogs, so fish can be an easy way to provide this nutrient. Fish is a great source of vitamins and other minerals. 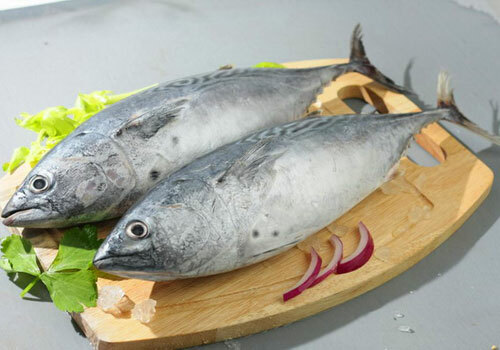 Fish contains important vitamins such as vitamin D and vitamin B12. In addition, fish is a source of calcium, phosphorus, and other minerals. These nutrients are extremely beneficial to your dog’s health and encourage the growth of strong muscles, bones, teeth, and more. Eating fish can help ensure a long and healthy life for your pet! 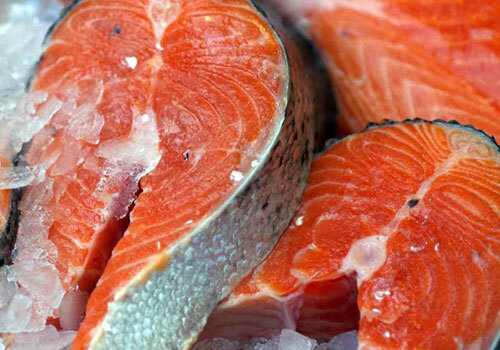 Fish can be a cheaper alternative to other sources of protein. For pet owners on a budget, fish can be a great way to save money while still providing your pet with the nutrients they need to thrive! Fish is low in saturated fats. Saturated fats can be harmful to your dog’s health and promote weight gain and disease. Feeding your dog fish rather than other proteins helps them to reduce their consumption of saturated fats, which results in happier and healthier pets! 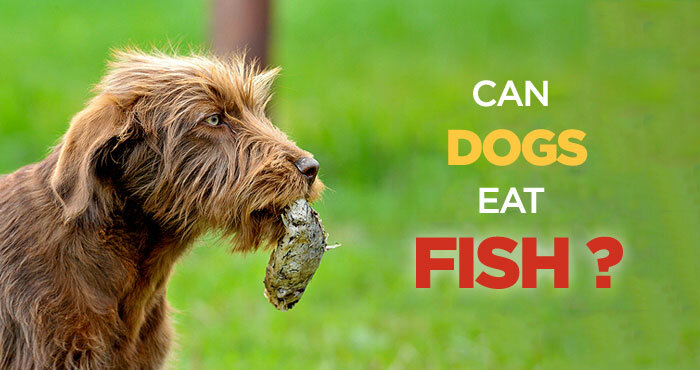 Fish shouldn’t be the main ingredient in your dog’s diet. While fish has some health benefits, it should be part of a balanced diet that includes other sources of protein and fat. Fish alone isn’t enough to provide all of the nutrients that your dog requires. Just as it does for humans, raw fish sometimes poses health risk for pets. It can contain harmful bacteria and diseases as a result of improper handling or preparation. While fish is generally safe for your pet, there are some health risks associated with consuming improperly packaged raw fish. Some fish are bad for your dog, and can even be poisonous. Blowfish in particular can be toxic for dogs and should be avoided. Excessive consumption of fish can result in mercury poisoning. Humans can get mercury poisoning too, which results from eating too many fish that have ingested mercury and other toxins, usually when they consume other fish in the ocean. Tuna in particular can be a risk for mercury poisoning. Pet food that contains fish can also be full of a preservative called ethoxyquin, which can cause liver failure and other health issues. Be careful of small bones. The bones that are sometimes present in fish can prove to be a choking hazard for your dog. Make sure to inspect the fish prior to consumption to make sure that no bones are present! Still can’t make up your mind? Watch this video, which shed light on this topic from different angles. Make sure that fish isn’t your dog’s primary protein source. While fish has many health benefits, canine digestive systems aren’t set up to digest fish more than one or two times per week. In addition, consumption of too much fish can result in poisoning form mercury or other toxins. Make sure to integrate fish into a healthy, balanced diet that includes other sources of protein. Watch out for choking hazards. Small bones can get stuck in your dog’s throat and cause serious damage! Shredding fish before consumption is an easy way to make sure that there aren’t any dangerous bones present. Make sure your fish is prepared well. If you intend to feed your dog raw fish, make sure that it is from a retailer that is known for providing high quality raw fish to consumers. If you wouldn’t eat it yourself, it probably isn’t safe for your dog, either. If you have any concerns about the safety of your raw fish, you can always cook the fish to ensure that it is safe for your pet to eat. Make sure to read the label on any pet food that contains fish to ensure that it contains quality ingredients and doesn’t list any potentially harmful preservatives! Choose fish species that are healthy for dogs to consume. Salmon, sardines, krill oil, and other fish are best for your pet. Other fish species are less optimal, and some, like blowfish, can even be poisonous! 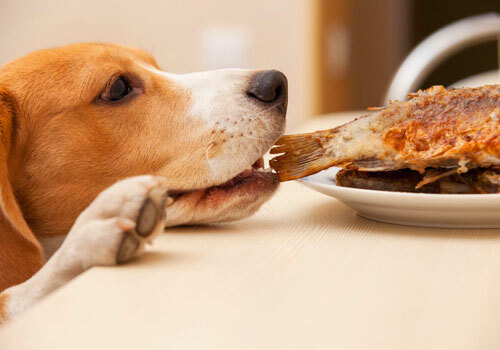 If properly prepared, fish can be a great source of protein for your dog. 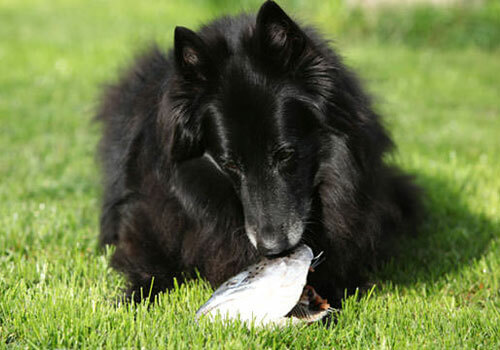 Some great fish species to feed your dog include salmon, sardines, krill oil, and other fish oil supplements for dogs. It’s important to include fish as part of a balanced diet that also contains other sources of proteins, fats, and nutrients. Your dog shouldn’t survive on fish exclusively, as it can have negative health effects. In addition, you should make sure that your dog doesn’t eat fish that could be harmful to them, such as fish that has been handled improperly, fish that contains small bones, or fish that contains high levels of mercury or other toxins. As long as you select fish with proven health benefits and no harmful side effects, raw fish can be a healthy addition to your pet’s diet that provides many benefits!